About "Ordering Triangle Sides and Angles"
In this section, you will learn how the sides of a triangle can be ordered from shortest to longest when the measures of the three angles are given. And also you will learn how angles of a triangle can be ordered from smallest to largest when the lengths of the three sides are given. Have you ever thought of the relationship between angles and sides of a triangle ? Look at the triangle in the figure shown below. 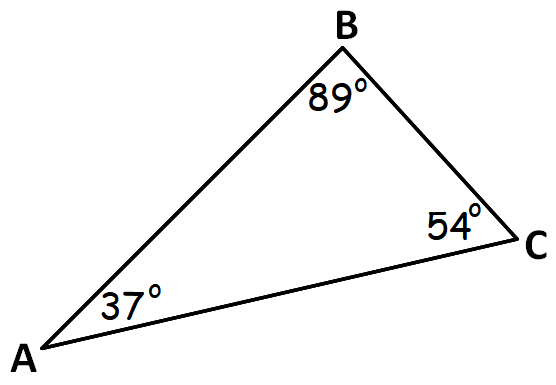 Find the largest angle in the figure and longest side in the figure. Where are they in relationship to each other ? 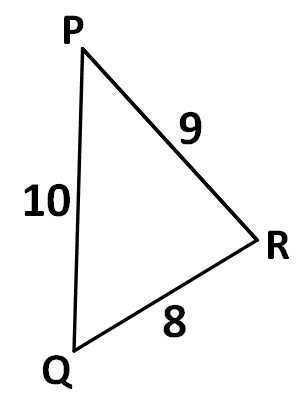 Find the smallest angle in the figure and shortest side in the figure. What do you notice about the placement of the largest angle and the longest side ? What did you notice about the placement of the smallest angle and the shortest side ? Can you form a conjecture for all triangles ? Hopefully you noticed the longest side is always opposite or "across from" the largest angle. What about the shortest side and smallest angle ? Hopefully you noticed the shortest side is always opposite or "across from" the smallest angle. So, can we order the lengths of a triangle when the angle are given ? Yes, we can order the lengths of a triangle when the angles are given. And also we can order the angles of a triangle when the lengths of the three sides are given. In the triangle ABC given below, order the sides from shortest to longest using the given angles. In any triangle, the smallest angle is always across from the shortest side and the largest angle is always across from the longest side. In the triangle ABC given above , because angle A is the smallest angle, the side BC must be the shortest side. And also, because angle B is the largest angle, the side AC must be the longest side. In the triangle PQR given below, order the angles from smallest to largest using the given sides. In any triangle, the shortest side is always across from the smallest angle and the longest side is always across from the largest side. In the triangle PQR given above , because the side QR is the shortest side, the angle P must be the smallest angle. And also, because the side PQ is the longest side, the angle R must be the largest angle. After having gone through the stuff above, we hope that the students would have understood how to order the sides and angles of a triangle from least to greatest. Apart from the stuff given on "Ordering triangle sides and angles", if you need any other stuff, please use our google custom search here.